Small kitchens with white cabinets can help your space look bigger, and brighter, which can enhance the entire atmosphere of your room. 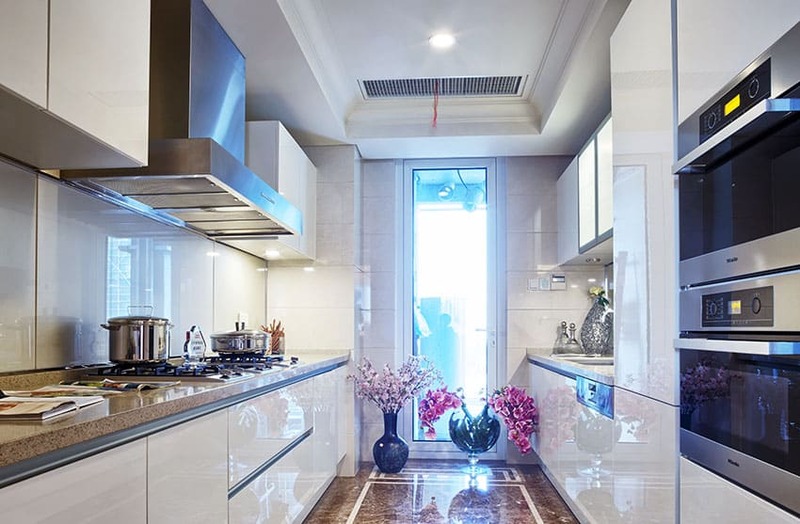 For any style of interior and any size of kitchen, using white kitchen cabinets will provide a clean, fresh and aesthetically-appealing look which would suit the taste and style preference of most people. On this gallery page we showcase a variety of small kitchen layouts utilizing different types of white cabinetry. 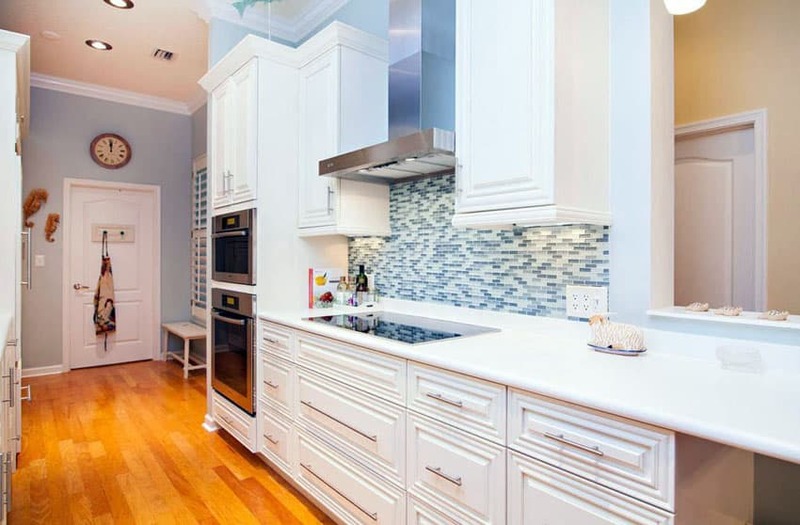 Why choose a white color palette for the kitchen? Some might say it is too plain, too ordinary or too common a color for kitchen design, but there are many valid reasons behind its popularity. For one, it’s a “foolproof” color, meaning it will look good on any style of interiors, with any other colors & textures, and will never go out of style. 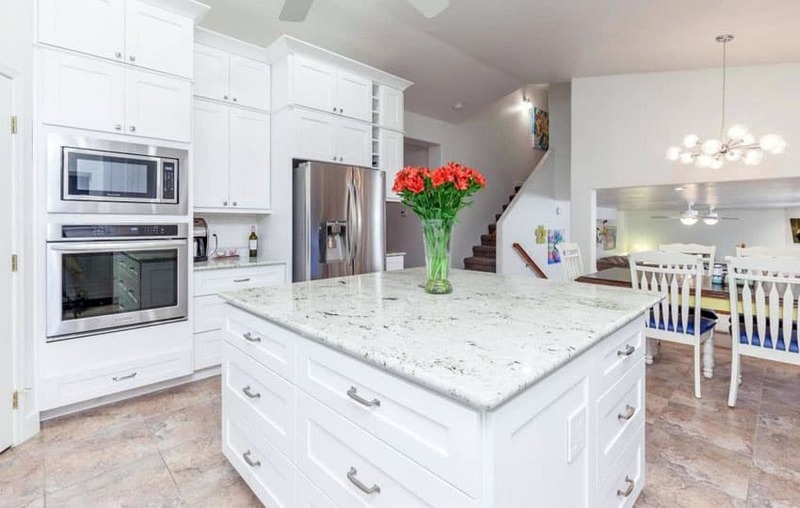 Aside from its universal appeal, white tends to help give a light, airy feel, and creates an illusion of a bigger space, so for smaller kitchens especially, white paint on your kitchen cabinets is ideal as it visually expands the size of any room. In the picture above is an inviting country style kitchen with a great layout for socializing with friends and family while preparing food. 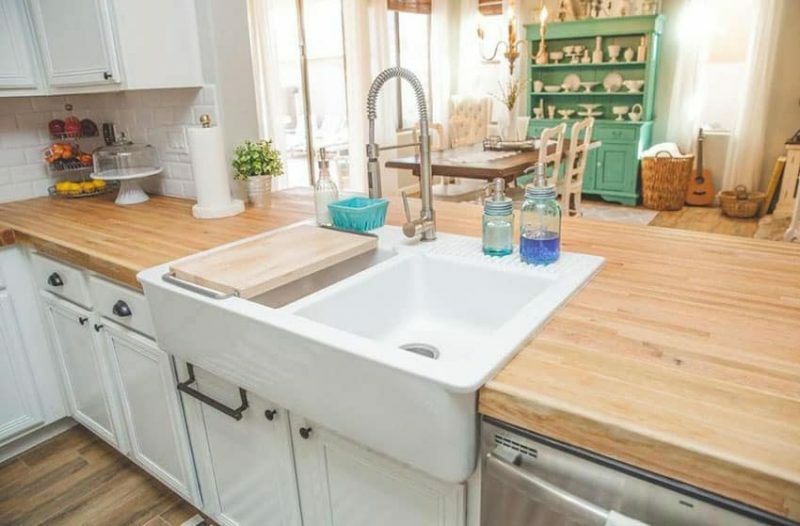 The kitchen offers a rough wood counter surrounding a double basin farmhouse sink with painted white cabinetry. The setup of the sink provides an easy pass-through from the main dining area of the cottage. 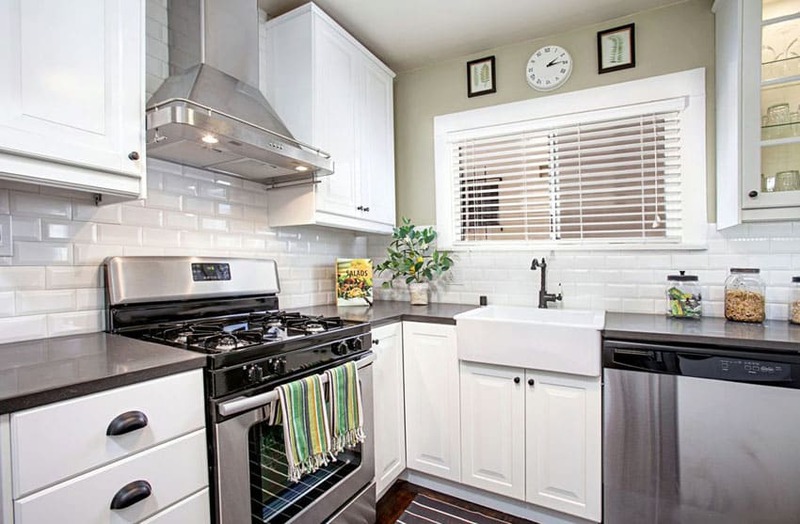 White subway tile backsplash brightens the space and helps keep things light. This small gallery kitchen is the perfect addition to this rustic home. The modern interiors uses a couple of rustic materials and details, to give it a subtle rustic feel, yet still keeps the clean look of modern interiors as it uses plain finishes and colors on the other parts of the house. The kitchen uses simple paneled cabinets in pure white, with an overhead cabinet featuring glass cabinet doors. 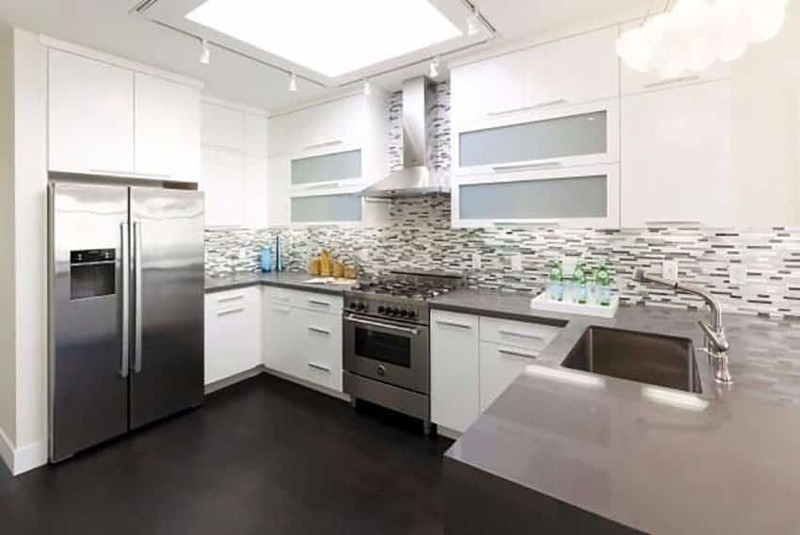 To add more texture and appeal, subway tiles made from gray glass were used for the kitchen backsplash, while gray & black soapstone was used for the countertop. 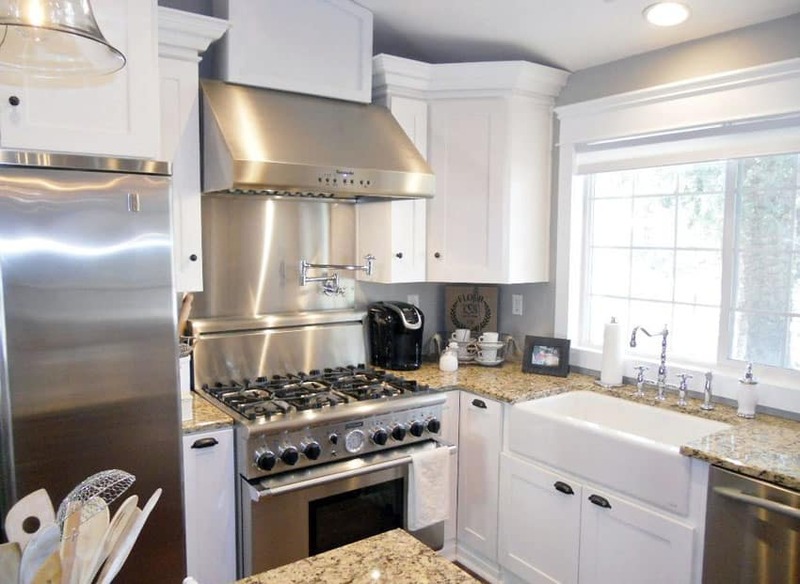 Deciding to go for all-white kitchen cabinets might be easy for some to say, until they realize that white paint has many varieties and undertones you can choose from. Just like any other color, white paint can come in cool tones to warm tones, and depending on the look you want to achieve for your kitchen, you must choose the appropriate shade of white. With the improvement of color-mixing technology, the variety of brands and finishes available on the market, it is not surprising to be a bit overwhelmed. Here we have listed some of the most common and most popular white paint shades, under two of the most popular paint brands. Hopefully, this list can help you narrow down your decision and select the perfect color for your dream white kitchen cabinets. Designer’s White – this bright white has a subtle cool tone which will definitely give that modern and refreshing feel to any surface. China White – as the name suggest, this color was inspired by China-wares. It has a warm / taupe undertone, giving it a clean yet subtle vintage look. Super White – a flat white color with a neutral undertone that delivers a crisp and clean white color. Mascarpone – this white has a light yellow undertone, making it look slightly tinted than being a flat white color. The bright yellow undertone gives it a youthful appeal, yet is still able to match more classic looks. Chantilly Lace – a cool-toned white with a minty undertone, which gives a refreshing feel on any surface. It gives a light, airy feel, as well as a youthful vibe without being too overwhelming. White Dove – a favorite choice of white wall paint color, this color is neutral-toned but has a beige & gray undertone, making it look like a very very light gray color that can match any style or go well on any surface. Pure white – similar to Benjamin Moor’s Super White, this is a neutral white color perfect for any style of interiors. Pearly white – this white has a very very subtle yellow undertone which you won’t notice until you place it beside a more neutral or cooler white.This is perfect if you want a clean white color, but find Pure white too flat for your taste. Antique white – another yellow-toned white with a little stronger yellow undertone. This is great for vintage looks. Paper white – a cool toned white which, as the name suggests, similar to the color of white paper. These colors work well on small kitchens with white cabinets, as well as the walls or ceiling, and the perfect white will depend on the look you’re trying to achieve. Do not be afraid to pair your whites with other, bolder colors, as whites will always look good with anything. With a large white surface such as kitchen cabinetry, you can freely experiment with different colors, textures and patterns to achieve your dream kitchen design. This is another small gallery kitchen with a more vitage feel to it. Pure white cabinets have a simple paneled design and vintage-style drawer pulls in stainless steel. The countertop uses a straight-profiled white marble for a modern touch on the classic material, while the backsplash uses mint green glass subway tiles. 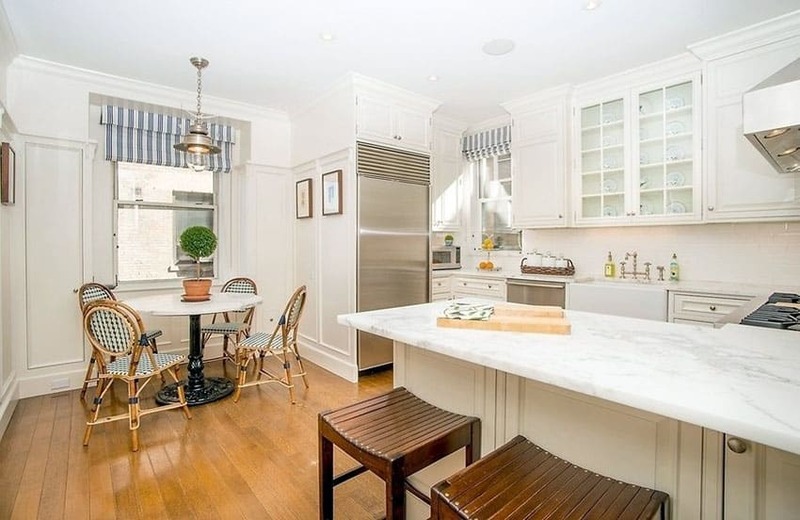 A very simple country style kitchen which-uses an all-white color scheme to create a clean, classic feel to this area. It uses pine wood floors that gives warmth to the space, while the walls and its panelings are all painted in white to match the color of the white kitchen cabinets. 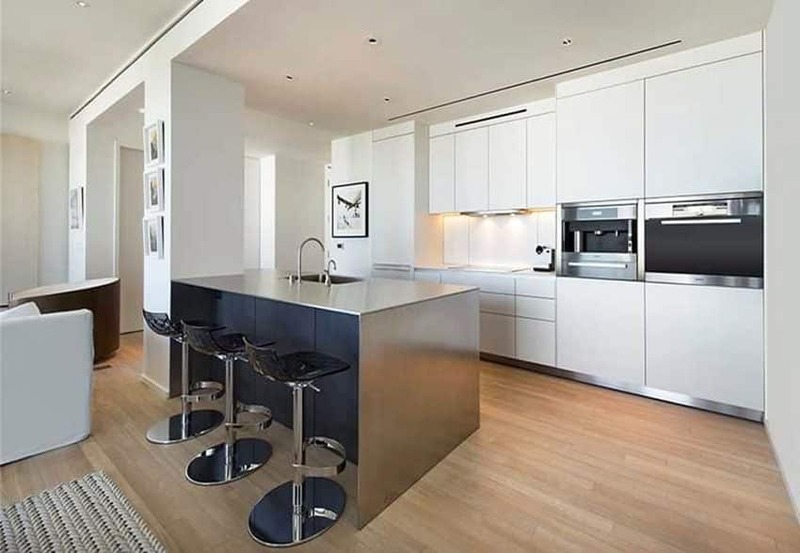 White marble coutners were used, combined with brushed stainless steel pulls to give the cabinets a modern touch. White is universally-appealing and therefore, even for more modern and minimalist interiors, white kitchen cabinets would surely look good. For this small kitchen placed on an open floor plan, it uses all-white laminated cabinets with built-in appliances for a cleaner look. It uses push-to-open door and drawer mechanisms for a cleaner look. 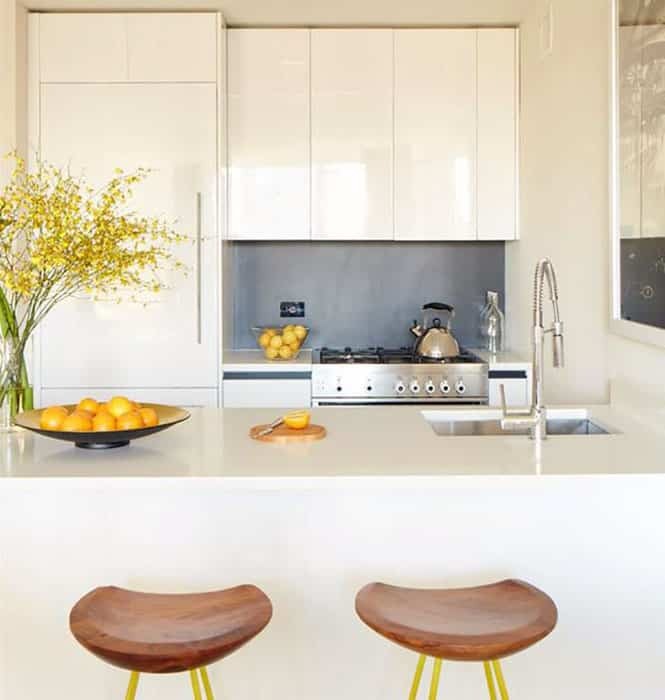 Combining different textures and colors is easy to do especially when you combine it with a large area of neutral colors, such as this kitchen which uses white paint on its wooden cabinetry. 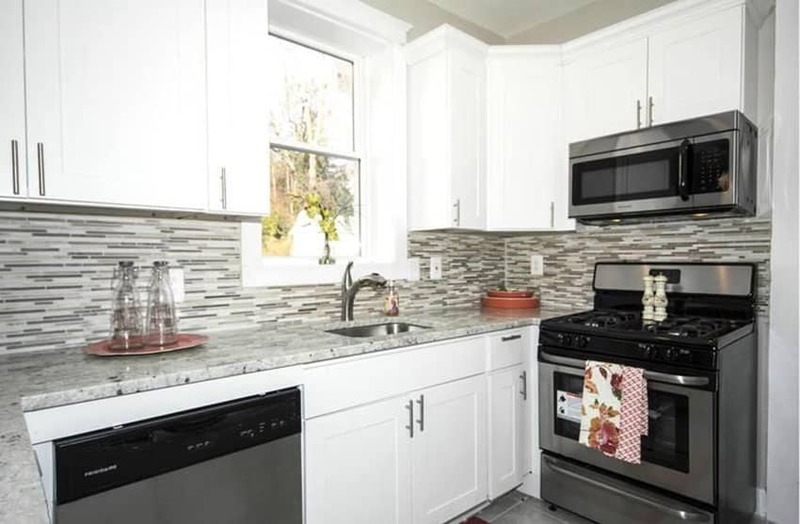 Oatmeal walls, gray tiles, combined with light gray quartz countertop and mosaic style backsplash tiles are neutralized by the large area the plain white kitchen cabinets occupy, making the over-all look cohesive despite the variety. 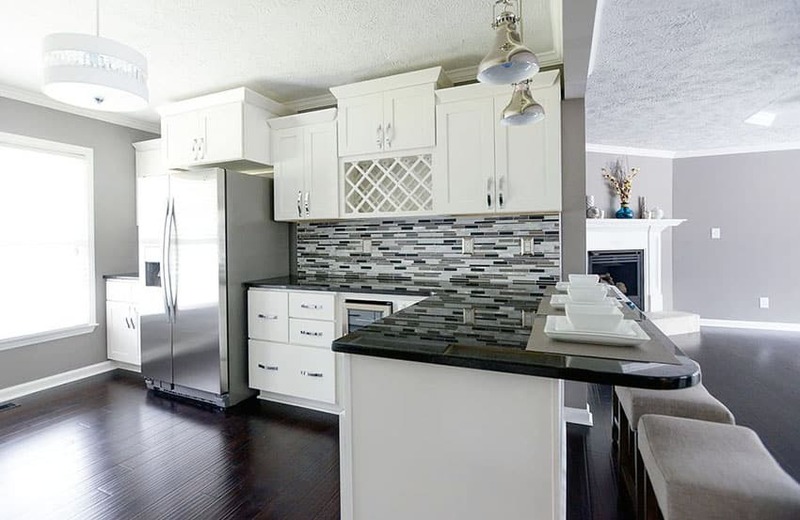 Classic-inpsired paneled cabinets were combine with a more modern style of dark gray solid surface countertop and white glass backsplash tiles to achieve this look. The white kitchen cabinets look gorgeous against the dove gray walls and the deep cheery wood flooring. 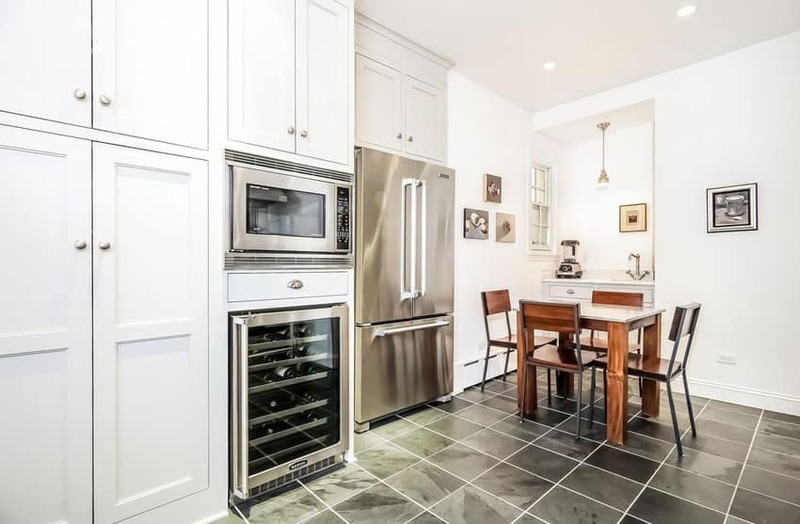 Another example of a classic-inspired kitchen applied on a modern space, the overhead-cabinets uses a notable classic style of wine holder, typically seen on French and country style interiors. 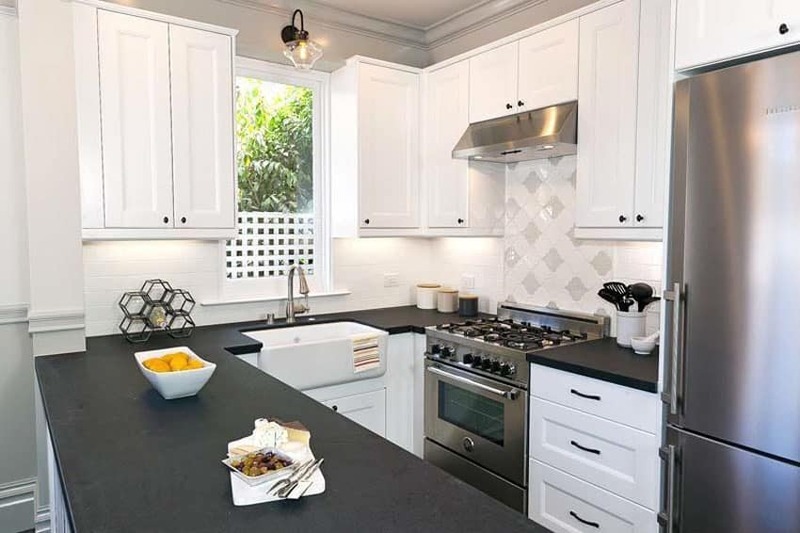 The mascarpone paint used on the cabinets blends well with the dark wengue wooden floors, black countertop and black and gray backsplash tiles, helping balance the colors so that it does not appear to dark. 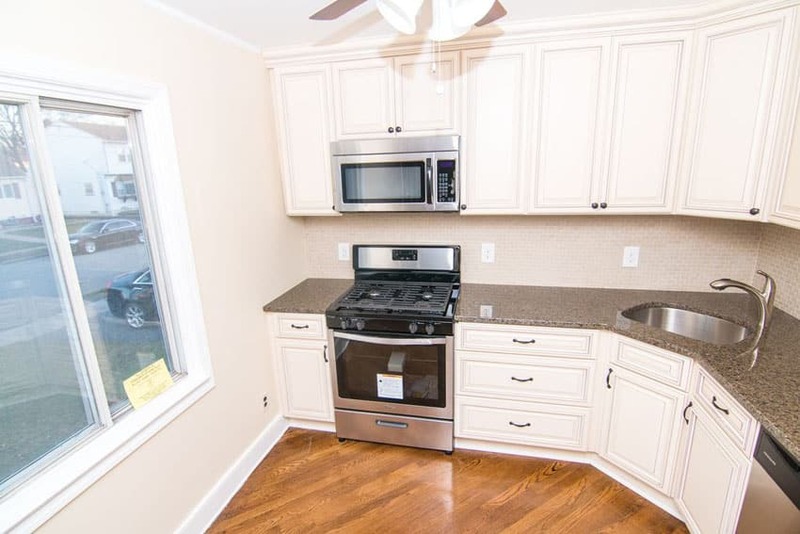 This small l-shape kitchen has a small kitchen island in the middle for additional workspace. The use of simple white paneled cabinets is the perfect match for the natural pine wood flooring. 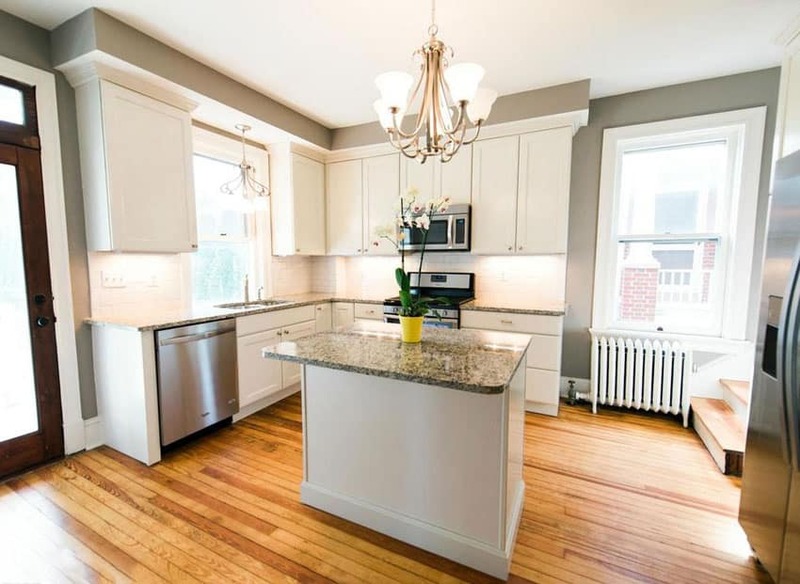 The walls were painted in gray, so the kitchen cabinets naturally stand-out, but does not look out-of-place as the baseboards and windows are all in white as well. 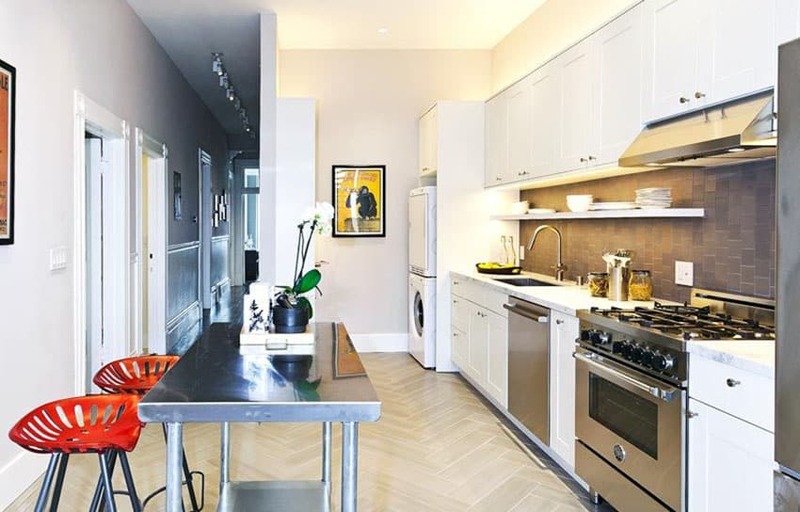 For tiny spaces such as this, contemporary style kitchens enables you to maximize the available space to give you a good balance of a workspace and storage space. This example uses white-laminated modular cabinets which maximizes the ceiling height for storage. White is the color of choice (except for the backsplash which uses dark gray paint) as while helps give the illusion of a bigger space. 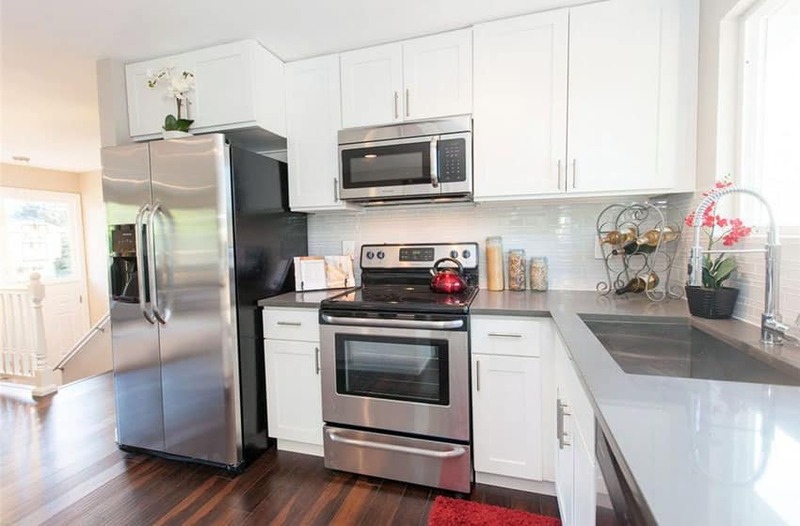 The clean off-white laminates make the kitchen look clean, crisp and modern. With the very limited space available, this modern U-shaped kitchen combines the use of Designer’s White paint on the kitchen cabinets and a unique matte black solid surface countertop with a straight-cut edge to create a masculine, modern feel. 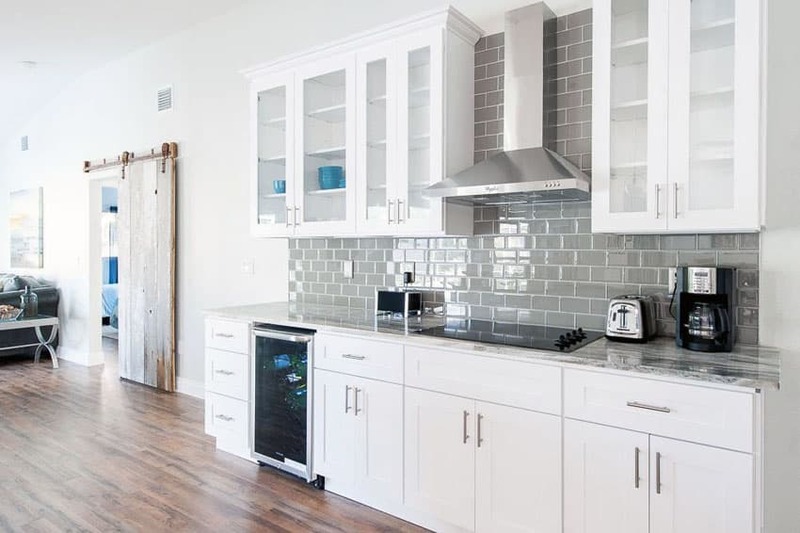 The backsplash uses white subway tiles with a very thin and narrow grouting for a clean look. The drawer and cabinet pulls also use matte black to match the look of the countertop. 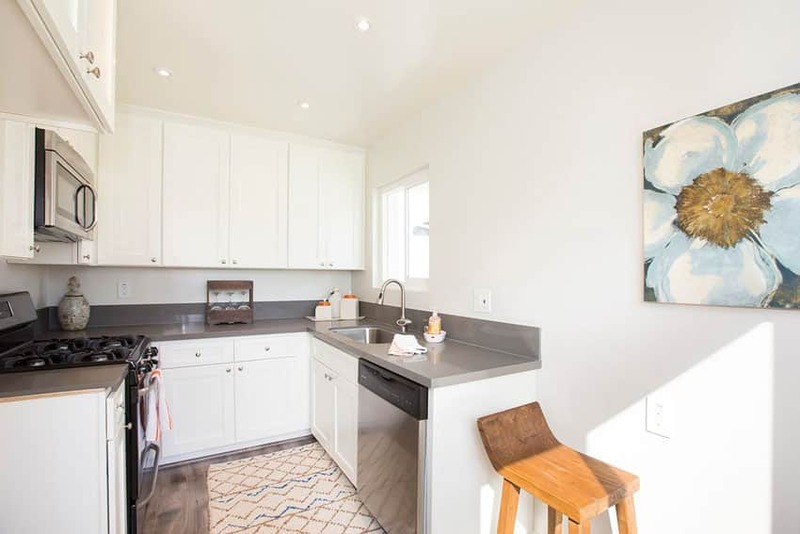 For a simple yet refreshing feel, this modern kitchen used China white pain on its simple paneled kitchen cabinets and tops it with light gray polished solid surface counters to give it a minimalist look. Paired with the rustic mocha brown faux wood floor tiles, the small kitchen definitely gives the right blend of simple and rustic finishes. Country-style interiors look best with country-style cabinets, but if you worry about your kitchen going out-of-style, using white-painted kitchen cabinets is the best option, just like in this example. 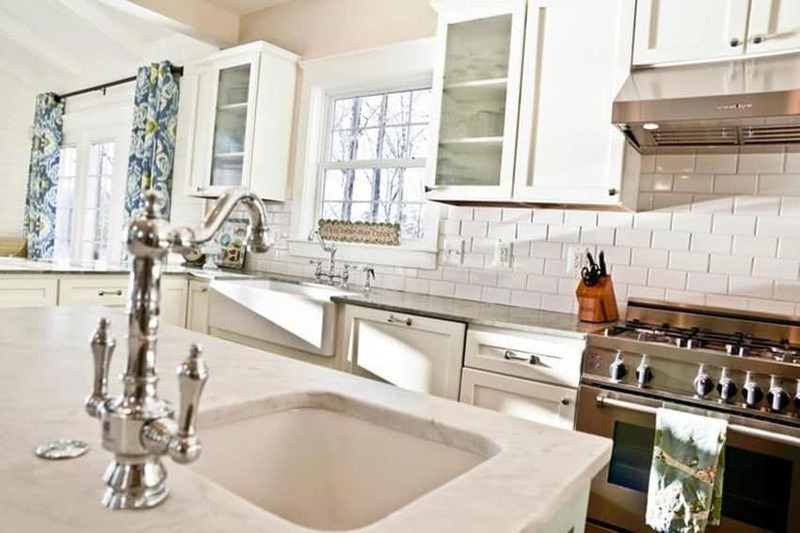 The classic kitchen uses all-white kitchen cabinets topped with white marble and white subway tiles for the backsplash, for a more timeless look that will match the interiors may it be modern, country, French, etc. For this modern kitchen, dove gray paint was used on the kitchen cabinets to give a little contrast to the pure white walls and windows. The dove gray paint gives a subtle yet modern updated to the classic paneled cabinets, and a light and refreshing look. It definitely goes well with the gray slate tiles on the flooring as well as the metal & wood dining chairs and table on the side. This modern kitchen utilizes two different types of cabinetry for its storage needs. While the kitchen would normally appear quite small on its own the addition of a small breakfast bar island really enhances the appearance of the kitchen layout. The island features a two tiered design with a small meal prep area and a lower level for eat-in dining. Another modern/contemporary kitchen design which combines gray polished surface countertops with plain white laminated kitchen cabinets for a clean and sleek look. The white cabinets stands out well against the dark wengue flooring material used, and also has a subtle contrast against the creamy white walls. This gorgeous gallery kitchen combines a simple paneled cabinetry with a variety of patterns and textures to achieves this contemporary look. It uses white marble for its countertop, and a unique matte black mosaic tiles for its backsplash, adding a modern texture and pattern on the surface. It also makes use of cantilever display shelf and under-cabinet lighting for an efficient work top. The floors uses wood finish ceramic tiles in light pine wood, and laid out in a chevron pattern, adding more texture to the area. 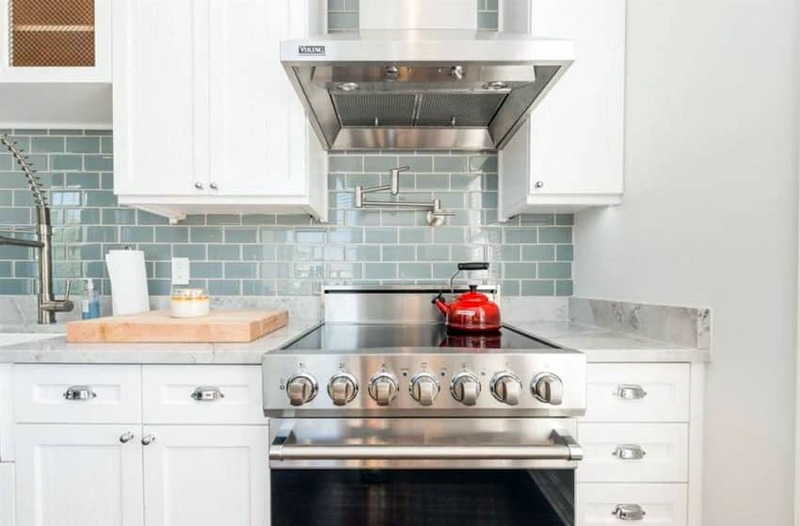 Another example of a retro-inspired contemporary kitchen which uses classic style modular kitchen cabinetry in white, combined with clean, modern finishes such as the gray quartz countertop and the white beveled subway tiles on the backsplash. It uses black vintage hardware to match the cabinets, as well as vintage style fixtures like the apron ceramic sink and the faucet. A very compact L-shaped kitchen which uses modular cabinets in Pure white, which helps it stand out against the white dove walls. 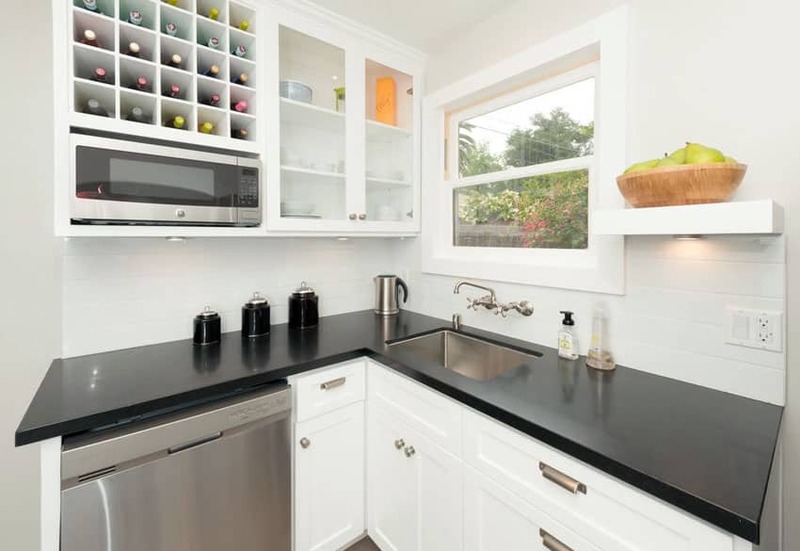 The kitchen cabinets uses a plain polished solid surface countertop in black for a clean, seamless look, combined with white subway tiles for a modern vintage look. Overhead cabinets have glass doors to display its contents, as well as an open wine rack. This vintage style kitchen would definitely look good in any style of interiors. 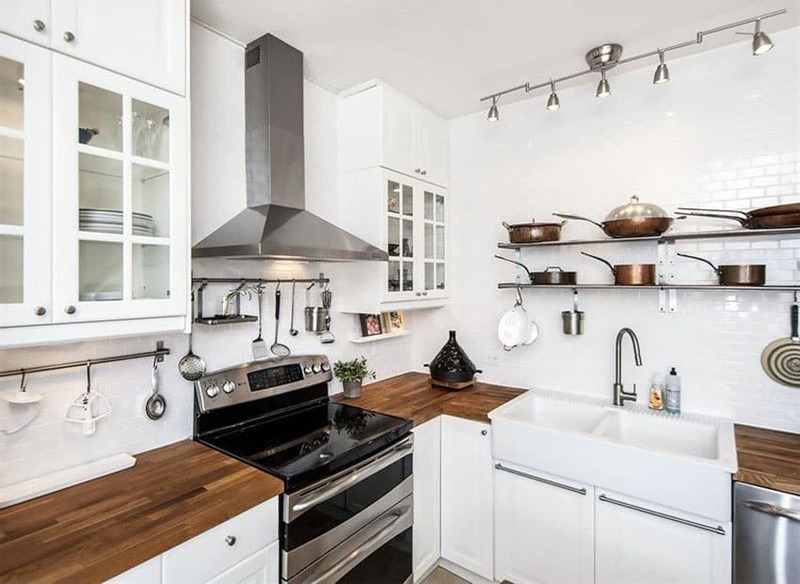 It has whit-painted kitchen cabinets which gives it a more timeless appeal, combined with vintage details such as the beige granite counters, the apron ceramic sink and other vintage accessories. This gorgeous kitchen goes for a modern rustic vibe with its all-white kitchen cabinets, and vintage style details. The countertop uses solid mahogany butcher’s block, adding warmth and texture, while the walls were finished with white subway tiles. On the walls, metal hanging rods and shelves were place, in which copper pots and pans were displayed to emphasize the rustic look it’s going for. This gallery kitchen is a great example of upgrading a classic kitchen style to match with the more modern interiors. The classic paneled cabinets were all painted in white to make way for the other colors in the room, like the gray walls, the teak wood flooring and the aquamarine glass subway tiles on the backsplash. The all-white cabinets helps balance out he color so the whole look would still be cohesive, and modern-looking. 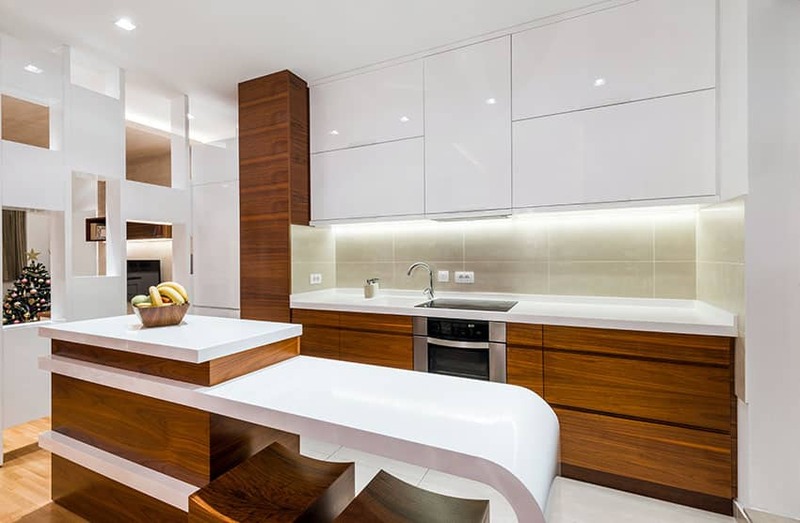 This modern galley kitchen may normally appear dark if not for the reflective quality of the polished white cabinets. the rooms natural light is limited to one frosted glass dorrway at the end of the galley design. Other wise recessed and under cabinet lighting is utilized to keep the room well lit. Little touches such as a raised tray ceiling and frosted glass cabinet doors can help to make the space look larger. Mascarpone-painted walls are paired with White China-painted paneled cabinets to create a classic, vintage-feel to this small kitchen. Other warm colors were mixed in as well, such as the teak wood flooring the mocha brown quartz countertop and the cream slate mosaic tiles used on the backsplash. 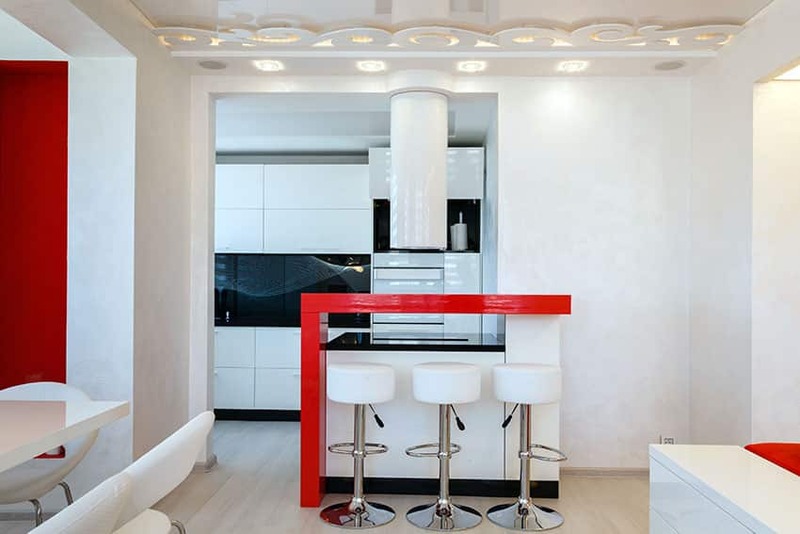 This is a contemporary kitchen design which uses modular kitchen cabinets, laminated in glossy white, combined with some red accents. This kitchen definitely gives that clean minimalist vibe, as even its drawers and awning cabinets uses white pulls for a cleaner look. The glossy finish of the laminates also adds to its modern minimalist appeal, while the red helps add a bold accent to make the interiors look more lively.